Are you considering a kitchen or bath remodel in 2018? Or are you building a new house? In the Virginia area, one word that's been left out of the renovation discussion for the past several years is laminate, unless you're talking about taking it out. 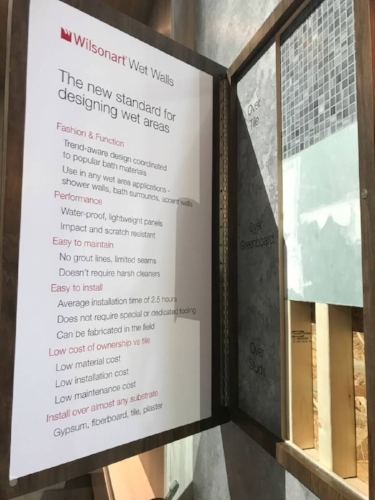 But, Wilsonart did a terrific job of educating me at the 2018 KBIS show in Orlando. These new laminates are not your Grandmother's old laminate! 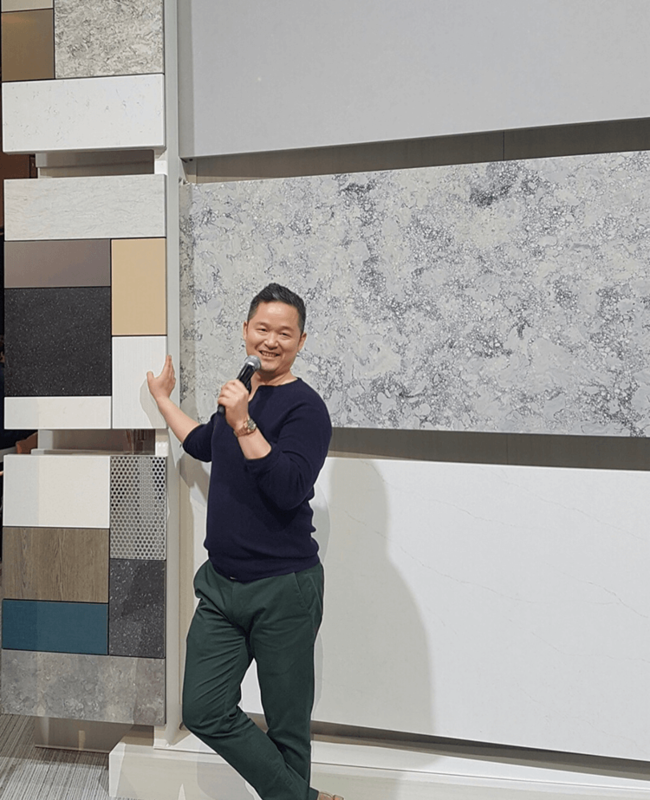 We were treated to a presentation by Danny Seo, Wilsonart’s spokesperson and host of NBC’s Naturally Danny, to showcase Wilsonart’s latest innovations. This beautiful kitchen vignette featured the new Soft Silk (-21) laminate finish which is a stunning ultra-matte surface. This new finish is incredibly soft and smooth with a silky touch. Visit www.wilsonart.com/finish-options to learn more this spring. One of the big trends that we saw throughout KBIS this year was the matte black finish. It was featured heavily by the plumbing showrooms in their fixtures, but also by a lot of cabinetry lines. While I love black cabinets, one drawback has always been that they show fingerprints and scratches. But with this new Soft Silk Finish featuring AEON™ Enhanced Scratch & Scuff Resistance Technology, fingerprints and scratches are a thing of the past! I also enjoyed seeing their Material Mixology Collection. With social media driving us to always stay ahead of trends and create instagram worthy spaces, Wilsonart has specially curated this collection that is bursting with character. The out-of-the-box laminates in this collection beautifully capture the fluidity of design style and trends between residential and commercial markets, and join hundreds of other one-of-a-kind designs in the Virtual Design Library collection of laminates. Check out the back lit Arctic Dune (#9253CM) laminate that serves as the backsplash in this terrific galley kitchen vignette. And I love the cabinetry by MasterBrand Cabinets featuring this Wilsonart Phantom Charcoal (#8214K-28) laminate. This was another terrific vignette showcasing how you can get high style with affordable laminates! Love how they were able to incorporate the very trendy waterfall countertop which wraps around the base also. They also have a lot of great wood grained laminates to create a hassle-free and easy to maintain shiplap wall. Wilsonart does a lot more than just laminate! They have a beautiful collection of quartz products with a wide variety of styles, colors and textures. They also do some wonderful things with their solid surface collection. Check out their "Wet Walls" system that allows you to install directly over tile for a quick bathroom update. Wilsonart Wet Wall System – Benjamin Grey 1887K-22 (behind mirror wall), Grey Elm 8201K-12 (shower), Pearl Sequoia 5001K-07 (vanity wrap) and Mangalore Mango 7984-38 (vanity reveal). These wet walls can simply any bathroom remodel project! 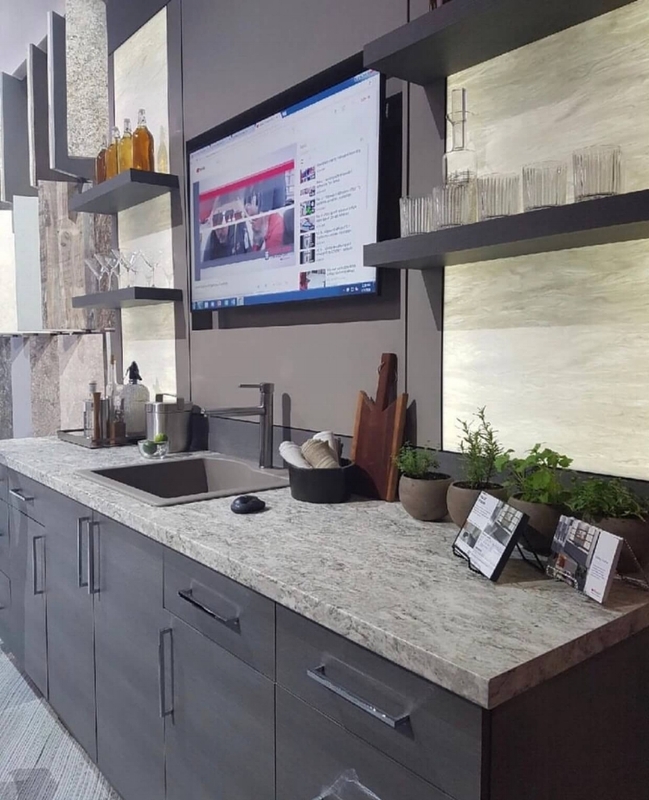 So, if you're entertaining the idea of undertaking a kitchen or bath renovation, be sure to think outside the box with your surface solutions. Laminates, quartz and solid surface materials from Wilsonart are for more than just countertop materials. They can provide a chic, yet affordable option for any surface in any space!